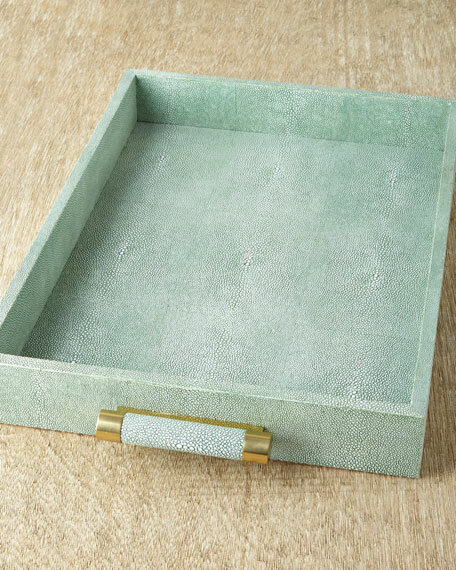 Not just gorgeous, this dual-handled shagreen tray is useful, too, in so many ways! Use it to serve cold drinks or coffee, on an upholstered ottoman as landing spot for beverages, to take breakfast in bed to someone special, on display with a few elegant objects insidethe possibilities are endless. Handcrafted of shagreen-embossed resin, wood, suede, and brass. Keep out of direct sunlight to avoid fading. 20"W x 14.5"D x 2.5"T.